TextMaster is redefining the way businesses handle translation. Let us show you how. web content for translation in just a few clicks. Upload your content to TextMaster, select the right languages and service level. That’s it – there are no hidden fees so the amount you see is what you pay. To make it even easier, we accept credit cards, PayPal and bank transfer. We will assign the most relevant translator to your project, guaranteeing that we will meet your project deadline and quality requirements. All of TextMaster’s translators undergo a rigorous selection process and their work is continuously monitored to ensure that it meets the highest quality standards. Our project managers oversee your project from start to finish, making sure everything runs smoothly. Our platform also lets you communicate directly with your translators to clarify any points and answer questions. For extra peace of mind, you can ask one of our experienced proofreaders to check over the translator’s work. Once completed, you can rate the project, allowing us to gather feedback and improve the quality of our translator base. 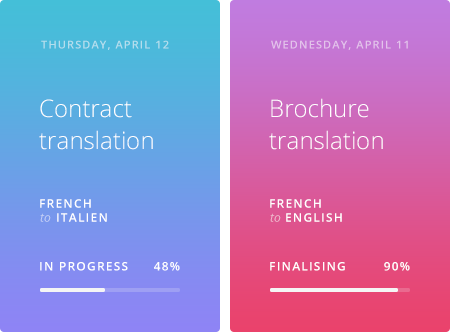 Most projects have an average turnaround time of 24 hours and when you launch your translation on the platform, you’ll receive an estimated delivery time. You can even specify a deadline when placing your order. For urgent projects, you can select the rush order option, which means that your project will be assigned with the highest priority.